Allianz Insurance Company of Kenya, a subsidiary of Allianz Africa, is pleased to officially open its doors for business in Kenya. 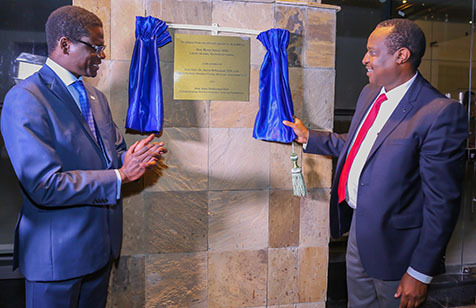 We unveiled Allianz Plaza on Riverside Driver as our Kenyan headquarters in an event attended by among others, the Treasury Cabinet Secretary Henry Rotich, IRA Acting CEO Godfrey Kiptum, Executive Director AKI Tom Gichuhi, and Allianz Africa Head, Frederic Baccelli. We are the latest entrant in the Kenyan insurance sector which currently has over 50 players. During the event, our CEO Mr Demba Sy, stated that the company will initially focus on general insurance products. We have already started underwriting personal and business insurance. The personal insurance products offered by our company include private motor insurance and motorcycle insurance. Other personal insurance products on offer include home insurance and personal accident insurance. On the business front, the company is offering motor commercial insurance, goods in transit insurance, and aviation insurance. Our entry into the Kenyan market is bound to cause excitement in a sector that has been characterized by stiff competition. Our decision to enter this market underlines our faith in the Kenyan market and is a good sign that the Kenyan insurance sector is maturing. Current estimates indicate that insurance penetration in Kenya is at 3%, a far cry from more mature markets such as South Africa which has a 12 % penetration.